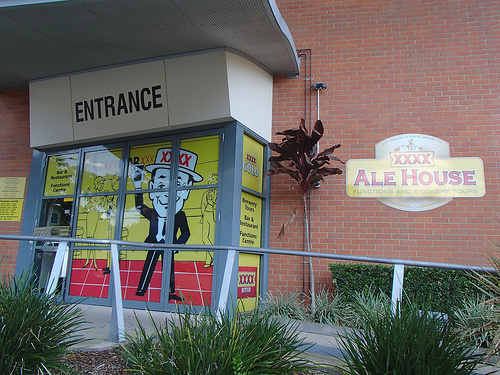 XXXX Brewery Tour is a great place to spend the day with friends or family visiting Brisbane! The Brisbane International Student Ambassadors and I went on the beer tour and then stayed for lunch at the restaurant. The Castlemain Perkins Brewery is an icon established in Milton in 1878 that still stands proud and tall serving as a heritage landmark for not only Brisbane but Queensland. Milton is an area of Brisbane that needs more attention. There are great places such as Bunker, The Scratch, and Comfort at My Table to name a few that are worth visiting! I’ll have to write another post about the above mentioned as well. No photography is allowed during the tour hence only the entrance photo! The tour begins in the gift shop and we are given protective goggles and a vest to wear throughout the duration of the tour. I really liked the historical videos we watched that gave us the origin and history of beer and then a separate video on the history of XXXX. They we learned about the raw ingredients and the brewing process that can be run by one person all on an electronic device! Another highlight of the tour was seeing all of the different marking designs for the beer labels and advertisements. The tour takes a little over an hour and ends at the XXXX Restaurant and Bar where you can taste a few samples of the fresh beers that is included in your tour ticket. Tours are available every day of the week but the times vary depending on weekday or weekend. You can find tour times and prices here. While we were visiting, they had a special beer on tap that we had to taste. I wasn’t the biggest fan but then again, I am not your beer me kind of gal. I wish they had a cider on tap but I always enjoy going on a brewery tour to learn about the history and how the beer is made. I come for the stories. Some of my favorite outings in Japan were visiting the Sapporo Brewery and the Suntory Kumamoto Brewery! The Sapporo Brewery has a famous all-you-can-eat restaurant next to it called Genghis Khan Hall. It was delicious and my favorite thing was that they gave you large plastic bags to put your coats and bags in so it wouldn’t smell like meat! I remember wondering why we were being given the large bags when we first entered the restaurant. After spending a good amount of time at the XXXX Brewery watching The Ashes and listening to live music, we decided to venture off to The Scratch and then to the Valley Fiesta where Yellow Tail was having a tasting of their new products! I loved their Pink Bubbles! It’s pink and has hints of strawberries, cherries and sweet spice which I LOVE. It was my favorite one that I tried that evening. A super fun day exploring two areas in Brisbane, Milton and Fortitude Valley! Check out the rest of the pictures from my fun day here!